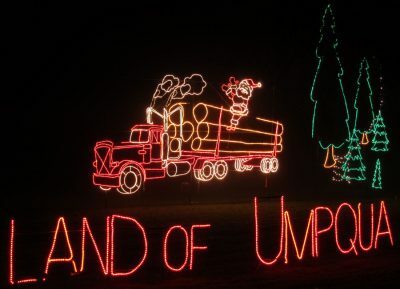 All Timber Valley Escapees are invited to join in the annual Sutherlin Resource Center’s free bus ride to the Umpqua Valley Festival of Lights . The Resource Center is providing the bus and professional driver, as well as the admission fee (which is usually $10 per vehicle). “All we are asked to do is to sign up in advance and then be sure to attend the event,” according to Chapter 9 president Rick DeYoung (# 184), liaison for this event. You do not need to be a Chapter 9 member to attend … all residents of the Sutherlin area can participate. The bus will load in the parking lot behind the Sutherlin Senior Center (northeast corner of Umpqua and Everett Streets) and public library. The departure is set for 5:45 p.m. on Thur., Dec. 14. The bus will return to the Senior Center by 8 p.m. The lighted parking lot has ample parking and is across the street from the Police Department. 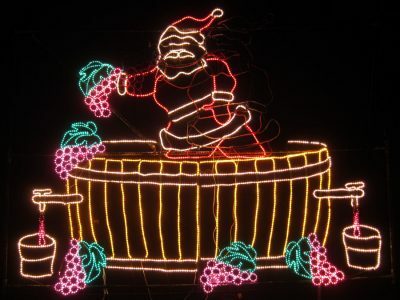 Any Timber Valley resident who needs transportation to and from the Senior Center can share a ride with a Chapter 9 member, leaving the Timber Valley clubhouse (lower parking area) at 5:15 p.m.
Further information about the bus trip and the Festival of Lights itself is on the sign-up sheet in the clubhouse. Please sign up so an accurate number of people will be known. This entry was posted in Events, Life at Timber Valley, News and tagged Chapter 9. Bookmark the permalink.